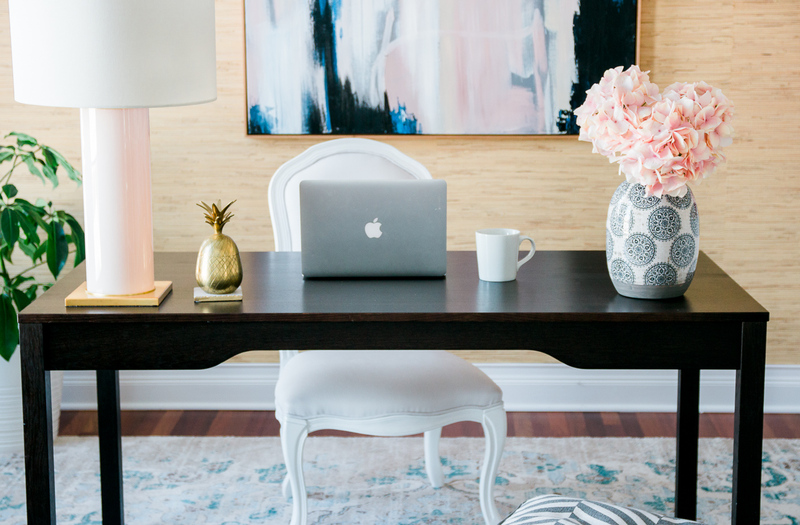 Home Office Makeover + Tips to Refresh Any Room! I have switched this space up twice now. Twice in one week. The first time, for myself. The second time, for the kids. 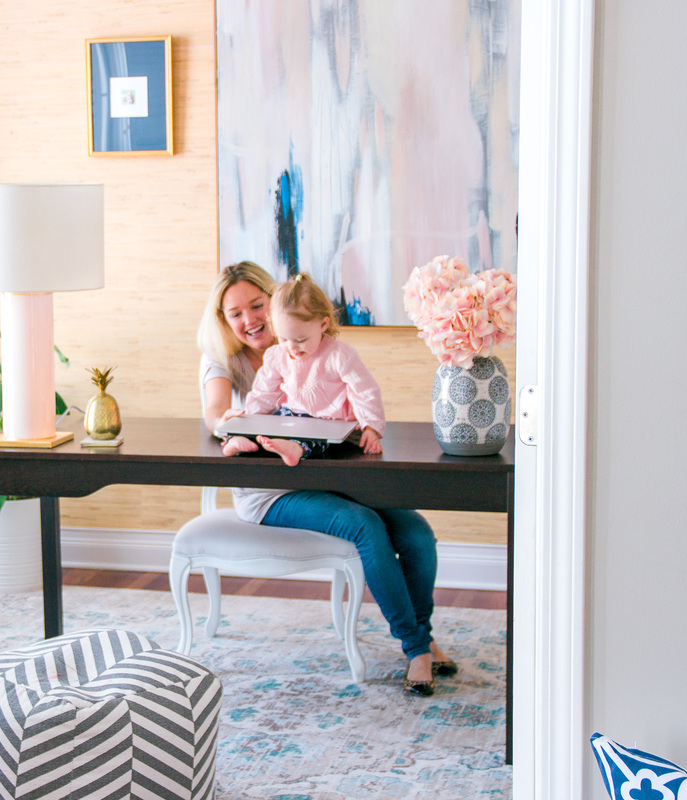 More on that later but I wanted to share how it looked this way (for myself) and share some tips on how to refresh ANY space in your house – without spending a penny! This is the first step to giving any room a refresh. Clear the clutter. Clear out everything in the room if you have to and only put back the items that you really want in the space. When selecting your items, choose pieces that you love or complement the pieces that you love. 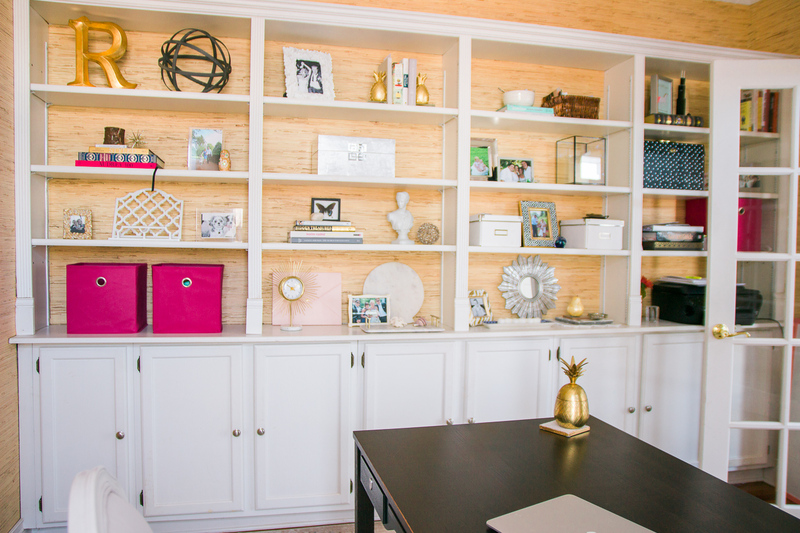 Organizing your space and decluttering makes a huge difference! Try different layouts with furniture, restyle shelves and tabletops, switch up artwork. This should come after the first step of decluttering of course. 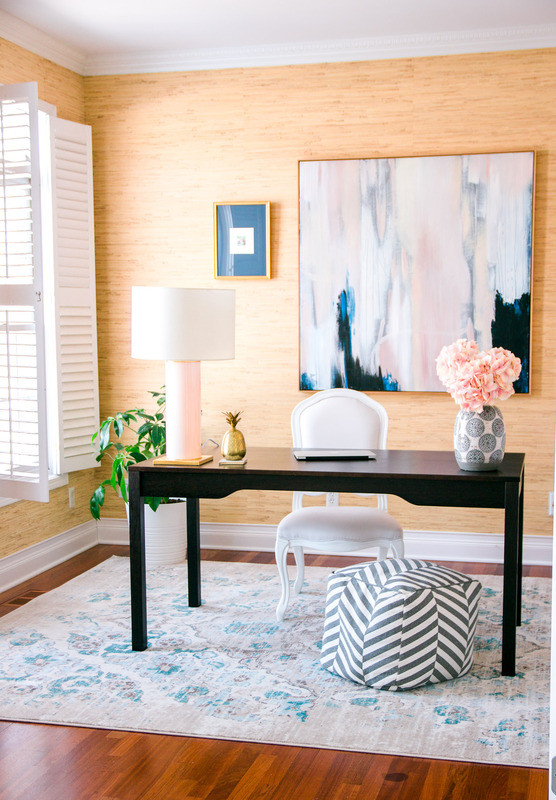 Clearing the room or spaces and seeing a blank canvas helps so much when you want to give a room a refresh. I took every single item off of these shelves to start. I kept some essential items and only pieces that I really like. I also try to utilize as many decorative, unique and functional pieces as possible in any space too. 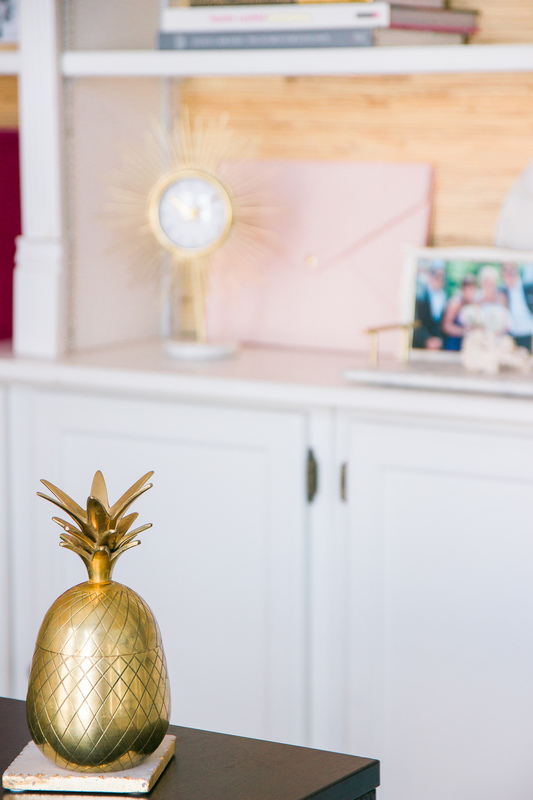 See that gold pineapple on the desk? It’s a thrifted find (only $4! ), it’s cute and currently holds our screen cleaners! Create a focal point and work around it. This focal point should be the first thing you see when you enter the room. Example: Your bed is the focal point of the bedroom. For our office, the focal point is the desk. Accentuated by the artwork! If you need help with this one for a particular space, you can always ask me! I did feel like something was missing on the wall when we just had the one large piece of art though. I love the dramatic look of one large piece and I’m not one for cluttered walls. I recently added one smaller picture from a favorite framing source, Frame and Matted. This completed the wall perfectly without being overdone! PS. Ill be sharing more of this soon plus a generous giveaway to Framed & Matted! This goes hand in hand with moving things around but if your space needs a change, this is the easiest and cheapest way to do it. Think vases, art, chairs, etc. What goes with your color scheme? What size pieces can you borrow from other rooms? 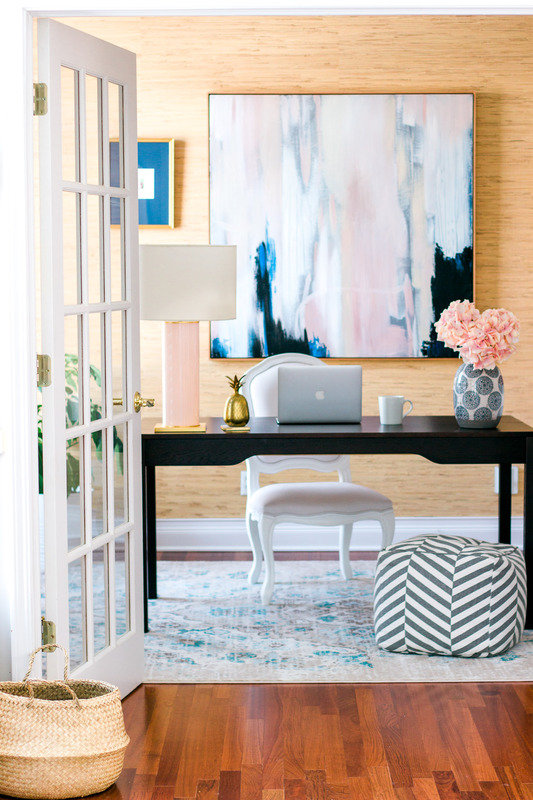 I choose pieces with blues, pinks and gold tones for this space. And that pouf floats around house (you may have seen it before!). 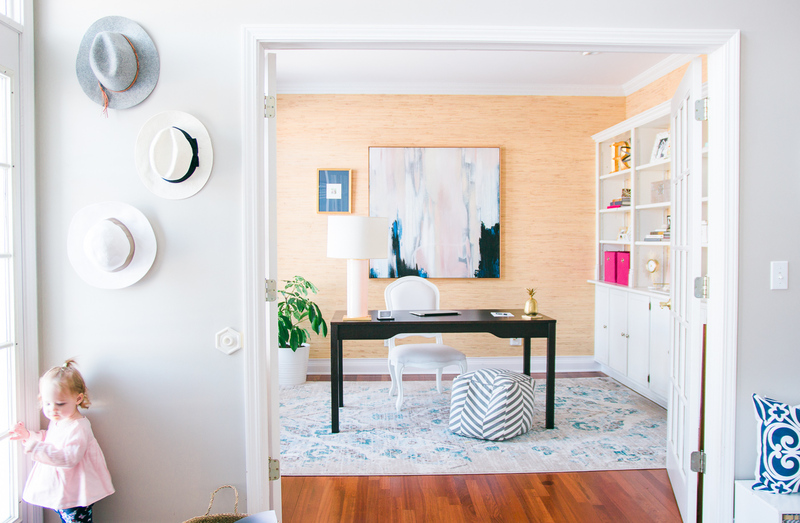 If you are going to make one single purchase to transform a space, start with the rug. This anchors the room and can make the biggest impact instantly. 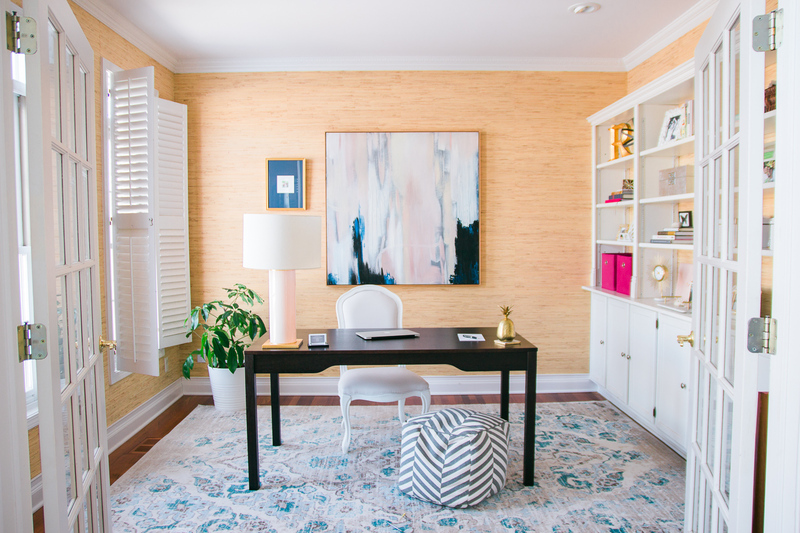 I moved our rug from our sunroom to the office and it instantly made this room look complete! PS. 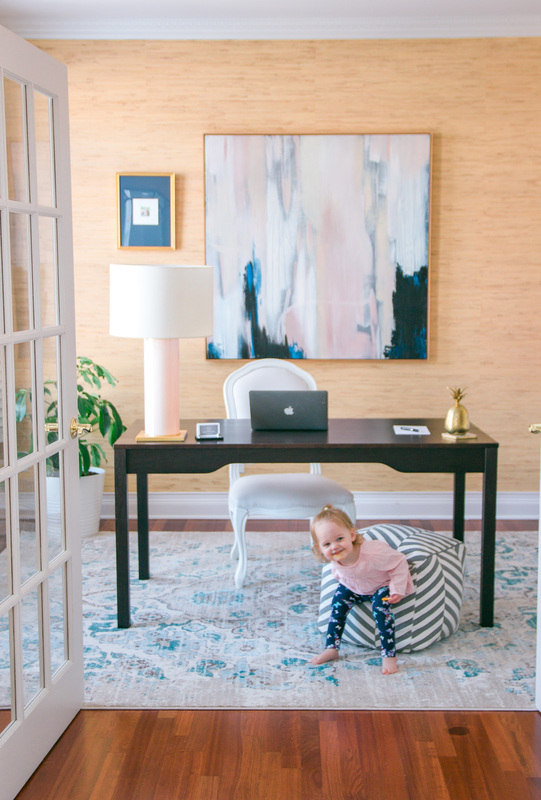 this rug is on sale for under $140! I’ve bought it 3 times. Once for ourselves. Once for a client’s formal living room. And it’s also in my mom’s dining room. Everyone has LOVED It! I’m not talking about a person, although Kinzie was a great “model” for these pictures! I like to add greenery or fresh flowers to every space. Here, I added a floor plant in the corner near the window and flowers to the desk. Tall plants work really well if you have the space. Since I can’t have fresh flowers all the time, I am always on the look out for good fake ones too. 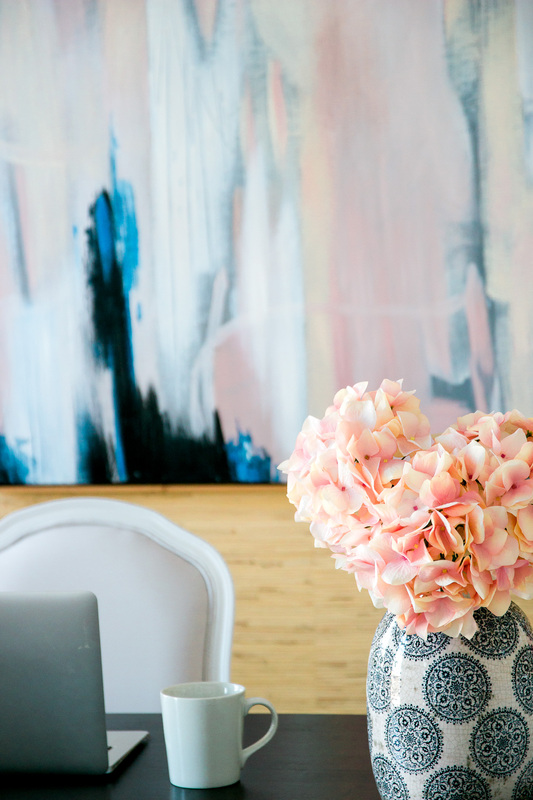 These faux pink hydrangea stems from Potterybarn are so realistic! In case your curious, the second time I rearranged this room was for the kids. It turns out, I don’t actually use this office as much as I hoped! 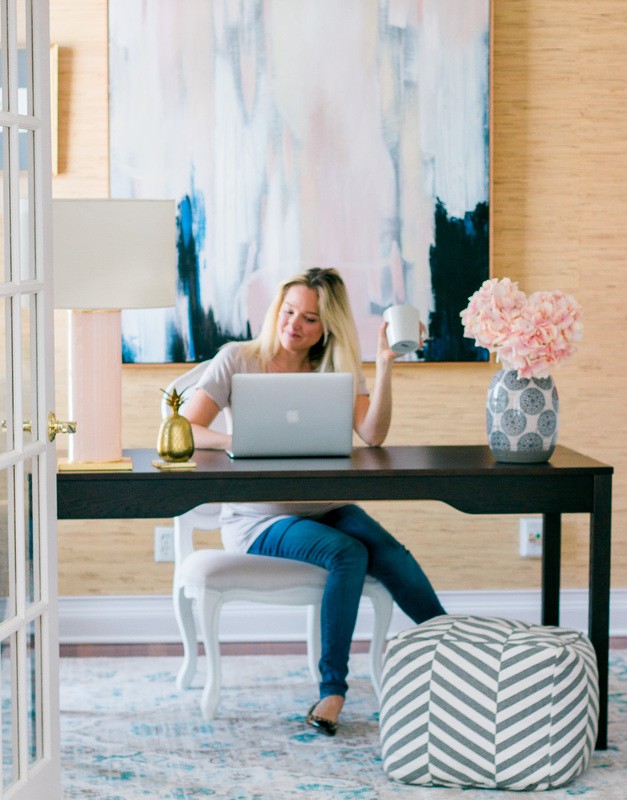 When I work, it is usually at the kitchen counter, out shopping for clients, or admittedly from my bed. (Does anyone else do this?) Only a few times a week did I actually sit down at the desk and work. Final note, if you are struggling with a space (or even a corner within a room), think and rethink about the purpose of that space that works for YOU. 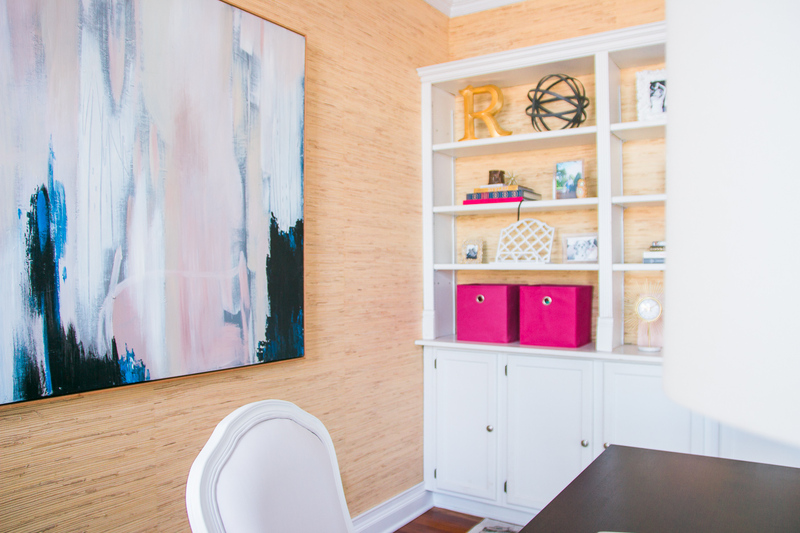 Just because it’s your “dining room”, it doesn’t mean that it has to be just a dining room….. So, this room is now going to be an office/playroom. A multi function room for our growing family! Please share where you purchase your large print behind the desk. It was a Homegoods find! I’ve had quite a few people ask about it so I’m hoping to find similar ones to share in a post 🙂 Thanks for asking!